FLO-FAST is the simplest, easiest and safest product on the market for transferring racing fluids. $24.95 Flat Rate Shipping. Oversized / Overweight Item. Ships from Michigan. $34.95 Flat Rate Shipping. Oversized / Overweight Item. Ships from Michigan. $29.95 Flat Rate Shipping. Oversized / Overweight Item. Ships from Michigan. Pit Stop USA is The Online Motorsports Superstore! The FLO-FAST Portable Fluid Transfer Systems was introduced to the racing market in December of 2005 at the PRI Trade Show (Performance Racing Industry). From all indications the FLO-FAST product is everything that we anticipated. This system has a multitude of applications in all forms of professional motorsports, recreational motorsports, The FLO-FAST Portable Fluid Transfer System was granted a United States patent # (7,163,034). The FLO-FAST system is an ideal tool for all racers and all forms. FLO-FAST will pump or draw fluid at a rate of 5 gallon per minute. You can pump oil, transmission fluid, anti-freeze, alcohol, gas, nitro, etc. FLO-FAST was developed by a racer and is a necessity for many who have fuel cells in tough to reach places. Most race cars are purpose built therefore the fuel cells are protected and many times are in a very tough spot for the conventional funnel and jug pour operation. The system was invented because of a Formula V Race Car fuel cell and for those of you who know what a Formula V race car is can appreciate the problems with fueling. FLO-FAST is the simplest, easiest and safest product on the market for transferring racing fluids. Once you use FLO-FAST you will be satisfied, we currently sell in all forms of racing from the sportsman to the professional. Being that FLO-FAST will PUMP or DRAW at the same rate of 5 gallon per minute, racers can simply put the hose into a barrel and rotate counterclockwise and pull fluid out of the barrel into their jugs. 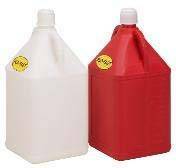 Then walk or cart your jug over to your car and pump clockwise and you will dispense 5 gallons per minute. We feature the FLO-FAST Portable Fluid Transfer System at low everyday prices.